On another bright, almost balmy, morning, Jackie drove us out to Hatchet Pond and back. and ponies, basked, dozed, chewed the cud, or cropped the grass on the approach to the pond. Eyes open or closed, they definitely think it’s spring. 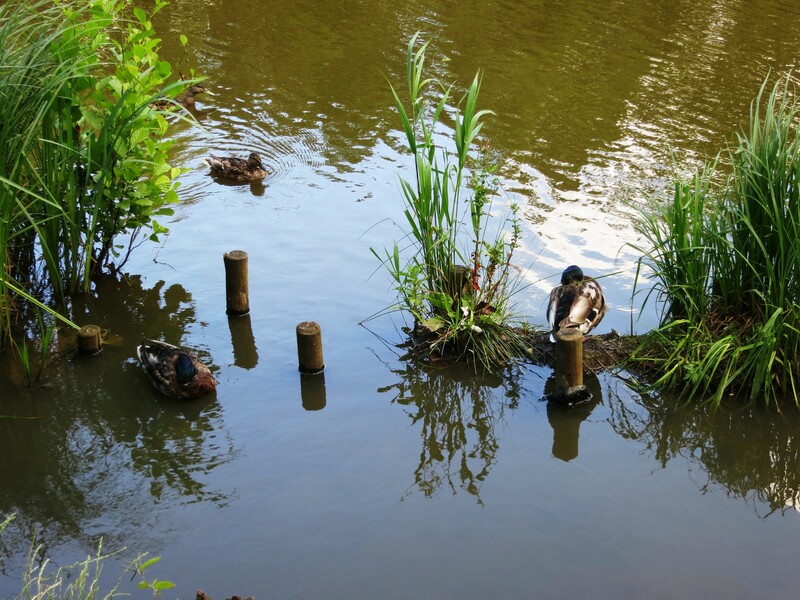 metamorphosed into a pair of swans gliding to and fro beside their posts? Sedate gulls basked and preened on the opposite bank. More ponies could be glimpsed among the still leafless trees within the nearby Rans Wood. This evening we dined on rack of pork ribs in barbecue sauce, prawn toasts, aromatic spring rolls, and Jackie’s special savoury rice, with which she drank Hoegaarden, from which I abstained. 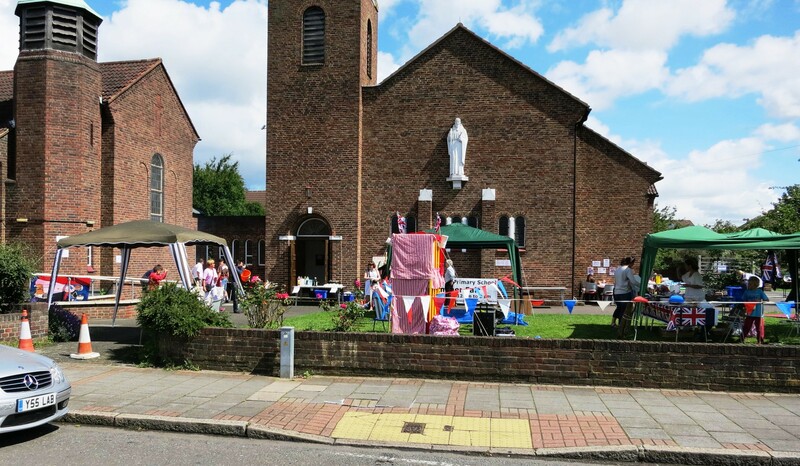 As I watched a group of brave people setting up St. James’ Church fete in Martin Way, en route to Cannon Hill Common, I reflected on the fact that most such events have been washed out this year. Jackie read this morning that the Godiva festival in Coventry, an event which takes a year in the planning, had had to be cancelled because of the torrential rain which has been flooding the Midlands for months. London has not suffered as much as the rest of the country, and today was bright, although very windy and cloudy. I wished this parochial effort well. Along the lake in the common people were fishing. These included a man with two children and a group of boys. The man had a fishing licence but was not a club member and knew nothing of the lease to the Wandle Piscators (see post of 31st. May). The boys were more interested in making fun of one of their group who, in attempting to retrieve something from the water, already with one saturated trouser-leg, was in danger of falling in, than in conversing with me. Mallards and coots were basking in the occasional shafts of sunlight. Another duck was shepherding her chicks. 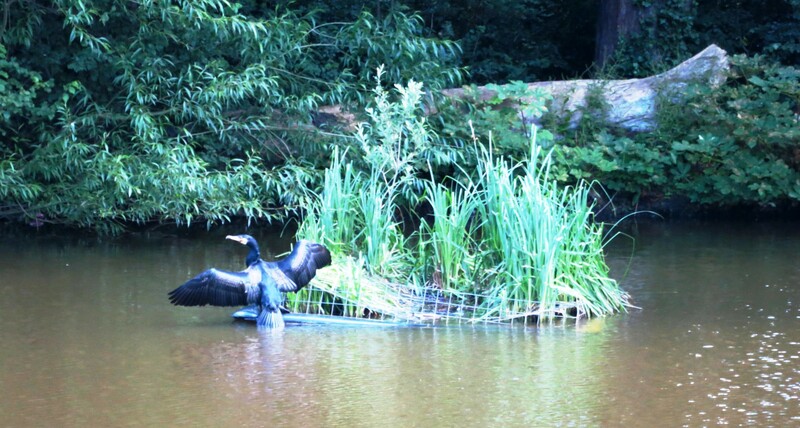 A cormorant on the far side of the lake was poised for the kill (of fish, not chicks). Three magpies I disturbed on the path fled to the safety of a solitary tree. Having emerged from the Joseph Hood recreation ground, alongside the common, a woman was training her Labrador puppy to cross the road. This prompted me to tell her the story of Piper. 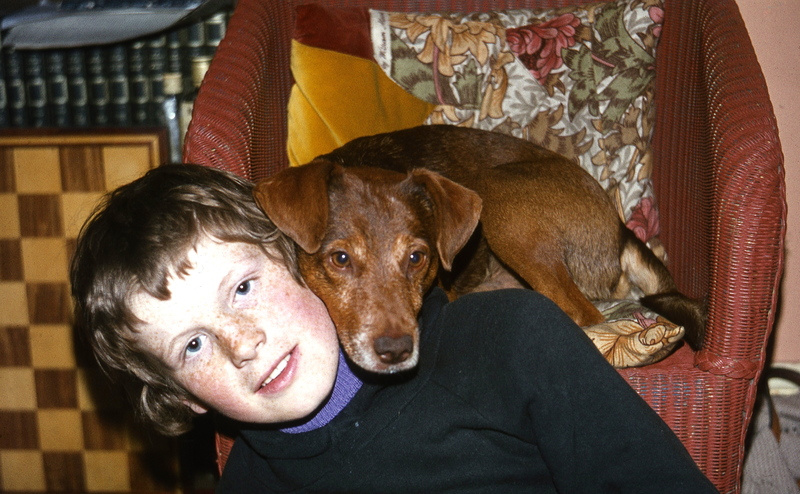 Piper was the dog who helped Michael upstage me in the launderette television scene (see post of 22nd. June). Some thirty odd years ago, when my son was still a teenager, we lived in Soho where Michael did a paper round. One morning he came back with a mongrel dog of uncertain age. Naturally he wished to keep him. Now, we lived in a tiny first floor flat in the middle of Chinatown. It seemed to me that it was unreasonable to keep a dog there. I was, however, outnumbered by two to one. Here was I, doing my best to have a quiet, uninterrupted, bath and I had both Jessica and Michael in tears pleading with me for my agreement. Feeling a heel (not one of those in the bath), I stuck to my guns for a while, but eventually reached the following compromise. Michael was instructed to take the dog back where he found him and put a note on his collar, and if an owner couldn’t be traced we would keep him. Silly me, I didn’t tell the boy what the note should say. The note, which Jessica kept for the rest of her life, read: ‘If you know this dog, please return him to his owner.’ This was followed by our telephone number. Michael much later confessed that he had not left Piper at all, but simply brought him back home saying he wouldn’t stop following him. The dog was well cared for and had clearly been loved. I often wondered whether something had happened to his original owner, and, if not, what the loss meant to him or her. Where did he get his name from? Well, he had been found on a paper round, so what better than the Cockney version of paper? Piper he was. Why did the woman training her dog in the art of crossing the road remind me of all this? Piper was a wanderer, well used to negotiating West End traffic. He always used zebra crossings. Off he would go walkabout, on his solitary expeditions, safely trotting across the striped paths at which all the cars had to stop. One day we had a telephone call (yes, a telephone on a landline, as was usual in those days) from the police. He had turned up in Hyde Park. Would we come and collect him? We explained that he knew his own way home and could safely negotiate the traffic. My listener was treated to a truncated version of this story and found it very endearing. Not so endearing, which saddened her, was Piper’s demise. After we moved to Gracedale Road in Furzedown Piper continued his wanderings, although at this time only when he could escape. He was by now very old, deaf and blind. One night we received a call from someone who told us that he had been run over on a zebra crossing. Michael and I collected the body and buried him in the garden. A sad end, indeed, but Piper had enjoyed a long and heathly life and perhaps would have chosen this way to go. In the afternoon we drove to Mat and Tess’s home in Upper Dicker in East Sussex. Alongside the A23 the limbs of a shattered oak sprawled in homage to the severe winds that have been blowing for weeks now. Cricket matches were in progress. For some reason best known to Jackie we went straight to their village shop. I was puzzled by this because I thought it was Tess’s day off. What happened next is too important to share a post. It will therefore receive its own tomorrow. A clue is that I have not rounded this one off with details of our evening meal.